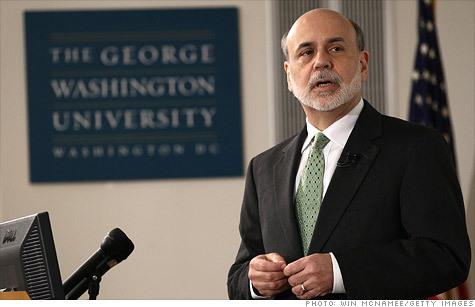 Federal Reserve Chairman Ben Bernanke lectures at George Washington University. WASHINGTON (CNNMoney) -- The bailouts of Bear Stearns and AIG were "distasteful" but still necessary, Federal Reserve Chairman Ben Bernanke told students at George Washington University on Tuesday. Meanwhile, the Fed was "helpless" when it came to saving Lehman Brothers, he said. "Lehman Brothers was in itself probably too big to fail, in the sense that its failure had enormous negative impacts on the global financial system," Bernanke said. "But there we were helpless, because it was essentially an insolvent firm." In a lecture about the Fed's emergency efforts during the financial crisis, Bernanke explained that the central bank was willing to bail out AIG (AIG, Fortune 500) and Bear Stearns because it expected both firms would eventually be able to pay back their loans. Bear Stearns was ultimately acquired by JPMorgan Chase (JPM, Fortune 500). Lehman Brothers, on the other hand, had no collateral to put up in exchange for the Fed's assistance. "It was very difficult and in many ways distasteful intervention that we had to do on the grounds that we needed to do that to prevent the system from collapsing," Bernanke said. " But clearly, it is something fundamentally wrong with a system in which some companies are 'too big to fail.'" Bernanke also told students that without the Fed's emergency efforts, the U.S. economy could have tanked even deeper. "I think the view is increasingly gaining acceptance that without the forceful policy response that stabilized the financial system in 2008 and early 2009, we could have had a much worse outcome in the economy," he said. The lecture was the third section of a four-part series at George Washington University, to be continued on Thursday. The Federal Reserve posts Bernanke's slides and full videos online.